Looking for a delicious New Years Eve pick-me-up cocktail? The Salty Irishman Coffee Cocktail is made with salted caramel and hazelnut flavors, as well as strong coffee to help you stay awake until the ball drops. This post is sponsored by Drizly and helps keep Food Above Gold ad free for your enjoyment! As always, all opinions are my own. I love the idea of New Years Eve. I find the parties to be romantic and festive, resolutions to be renewing and invigorating, and I love to start something new by kissing my handsome husband. In reality though, New Years Eve isn’t my holiday. Not because I don’t find it wonderful, but because I’m really an old lady stuck in a 20-something year old body and I have the hardest time staying awake. If you want an awesome New Years Eve, here are two things I recommend for complete success. A constant flow of drinks is a key component to any good celebration, whether its for two or twenty. Drizly, the largest alcohol delivery company in the United States, can help you stay on top of it. All you have to do is get online and place your order, and if you’re within their delivery zone, you can have all the best wine, beer, or cocktail makings at your door in ONE HOUR!!! Yes, you heard me right. ONE HOUR!!! They even stock extra goodies like soda, garnishes, mixers and juices for all your mixology needs! Additionally, my favorite thing is that they use stores local to you so you are still supporting your community. Isn’t this the most brilliant idea ever?!?!?! One thing I quickly learned after turning 21 was that New Year’s Eve drinking is a special kind of drinking. For most people, alcohol makes them sleepy (raises hand and points at self!). I’m not personally a fan of energy drinks, so I need something else to help me stay energized until midnight. Enter the Salty Irishman (there are so many jokes I could make right now…). 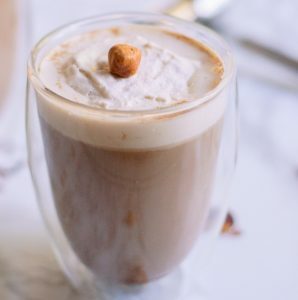 This cocktail is made of super strong coffee, salted caramel Irish cream, hazelnut liqueur, and garnished with delicious vanilla bean whipped cream and toasted hazelnuts. It can even be served iced! One tip before we go any further: I recommend using french press coffee for this cocktail because it allows you to steep it to your heart’s content. If you choose to use drip coffee, make sure that it doesn’t sit on the burner for any longer than an hour before use or the flavor of the coffee will become burnt and may make the cocktail taste funny. As with any coffee, the fresher the better. 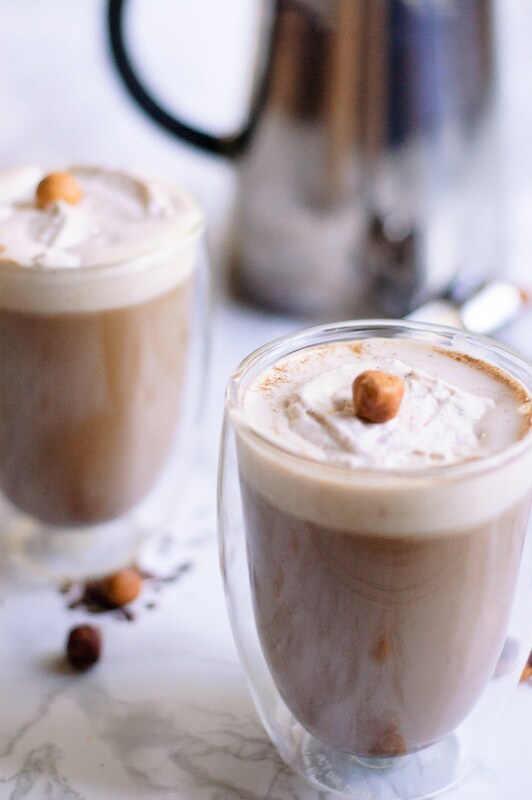 Get your free printable grocery list for this Salty Irishman Coffee Cocktail HERE. 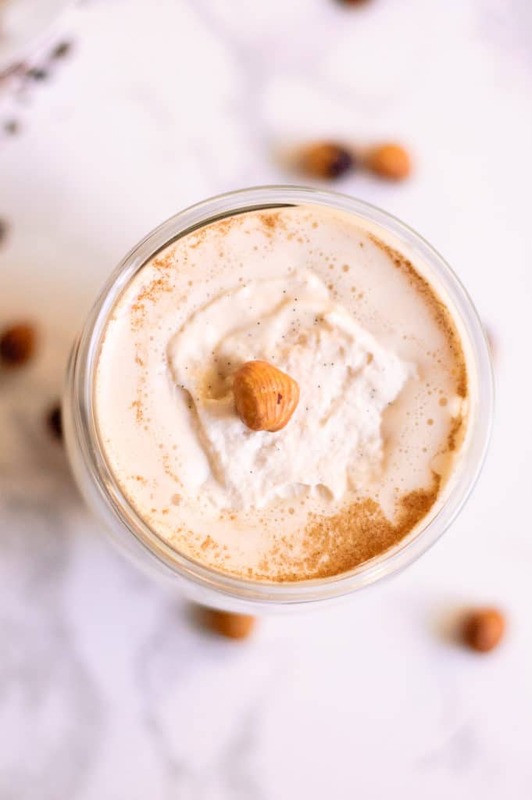 This grocery list has everything that you’ll need to make this Salty Irishman Coffee Cocktail recipe. To help in making grocery shopping simple, each ingredient is listed in easy-to-find grocery store amounts. If there is no amount specified, that means that you can buy the smallest (or largest) container available and still have plenty left over. Need a pick-me-up cocktail? 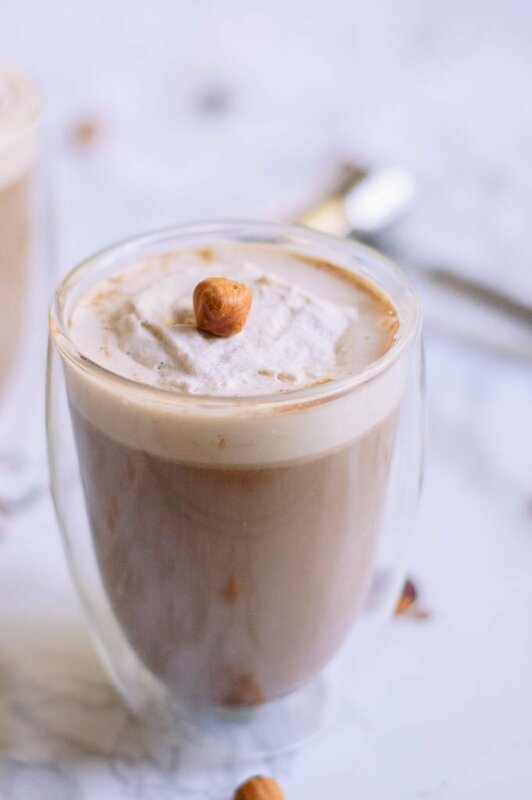 The Salty Irishman Coffee Cocktail is made with coffee, salted caramel, & hazelnut, then topped with vanilla bean whipped cream! In a small bowl combine the heavy whipping cream, vanilla bean paste, and granulated sugar. Use a whisk to whip the cream until it starts to form a ball. You want it to be very firm. Cover and place in the refrigerator, or set aside. Place the hazelnut liqueur and salted caramel Irish cream in the bottom of a coffee tumbler. Top with 8 ounces of fresh strong coffee leaving at least 1/2" of space in the glass. Spoon the vanilla bean whipped cream garnish on top then finish with a toasted hazelnut. Serve immediately. This looks and sounds so amazing! I’m trying this one out for sure!! Thank you Amanda! I hope you love it!